1. What’s the toughest situation you’ve ever been in as a police officer and how did you handle it? There have been several. One that stands out was a shoot/don’t shoot situation. I interrupted a breaking and entering in progress and the suspects jumped into their van to get away and were driving directly at me. It was wintertime and I was standing on ice, which complicated the decision. What will happen if I slip and am unable to get out of the way? I had just a few moments to decide whether to shoot the driver or not. It would have been a justifiable shooting as I was imminent danger of serious physical harm or death. I chose not to shoot. The suspects got away but I got the license plate number as they sped past and through investigation they were tracked down and arrested. Sometimes what can be done, or what may be justified legally, isn’t necessarily what should be done. It’s almost always better to choose the path of the least amount of force necessary in a situation. 2. What’s the impact on police and the community when there’s a questionable shooting? There is a compounding effect. We must be honest and realize that these things have been happening for a long time, but we’re just now seeing them publicly with the prevalence of cell phone cameras. And now, as they seemingly come in bunches, there is more and more outrage and uneasiness in African-American communities in particular. The reason why it’s important for good police officers to speak out and call out these horrific shootings is that they make our jobs more difficult. The less trust and cooperation you have in a community, the harder it is to provide effective police services. This makes it more dangerous as well as frustrations building and people simply look to oppose authority. It’s a losing proposition for everyone. 3. In Cincinnati, we’ve had some high profile shootings of black men over the years—Timothy Thomas and Sam DuBose, in particular. Any thoughts on these shootings from your experience? The Timothy Thomas shooting led to civil disorder in 2001, which ultimately led to a federal consent decree and a groundbreaking collaborative agreement between the Justice Department, the Cincinnati Police Department, and the community. Real reforms were made and while not perfect by any means, positive changes have occurred within the Cincinnati Police Department that have made it a model for big city policing. More can and should be done, but there are many police departments throughout the country the have not had their “Cincinnati moment.” These agencies worry me. And we are seeing some of those outcomes now. It’s important to remember that the DuBose shooting was by a University of Cincinnati police officers. UCPD was not subject to the collaborative agreement and we’ve learned that there were serious problems with their strategy of off-campus patrol and traffic stops in the surrounding, predominantly African-American neighborhoods. The university now appears to be addressing those issues, but unfortunately after an unnecessary death. 4. What have you seen officers do right and what are some areas where they could improve? Officer Tommy Norman’s Facebook page. 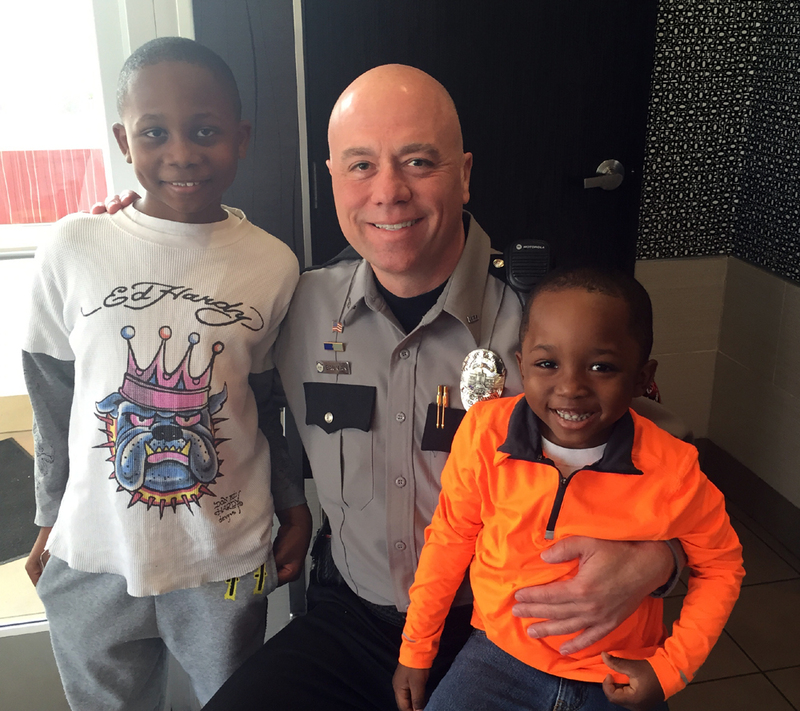 The best things happening right now are those officers who are getting out of their cruisers on a daily basis and interacting with the community, getting to know people as people. 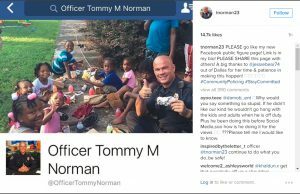 One great example is Officer Tommy Norman of North Little Rock, Arkansas, PD. He is very active on social media posting photos and videos daily of his interactions with residents, particularly the kids in the low-income neighborhood that he patrols. Another example are the Running Man videos that police departments across the country are doing. Anything that breaks down barriers, gets officers interacting with the community and citizens seeing police officers as real people, not robots. Note: I embedded Cincinnati’s video above because embed was disabled on Detroit’s video. I hate to say it but Detroit’s is pretty amazing. 5. Is there anything people can do to help bridge the gap with officers? Say “hi.” Be the one to help build bridges. One day I was standing in line to get lunch at Subway. The African-American teenage male in front of me bought my lunch. That led to a great conversation. It’s the sum of these types of interactions between individuals every day that will help. In the long term, get involved. People have to be the change that they want to see. Consider law enforcement as a career. Real change happens from within. 6. How should police deal with racism? Don’t be silent. If you see or hear someone saying or doing something inappropriate, call them out on it. No more going along to get along. 7. What one question am I not asking that I should be asking? And what’s your response? We have to fix this in the long term. Right now good people, people with options, are choosing not to go into law enforcement as a career because it’s simply not worth it. Some departments are only getting 20 percent of the applicants that they did a decade ago. This is a real problem that may not entirely manifest itself until five or 10 years down the road and it doesn’t make me any more optimistic that we’ll be able to achieve that outcomes that we want and need. Update October 15, 2017: Derek Bauman is now running for Cincinnati city council.